The big dissapointment in Chennai was that we didn't see any of the "Madras" cloth shirts which were so popular when I (John) was in college. ;-) Of course, a few years have passed since then and Madras is now called Chennai. 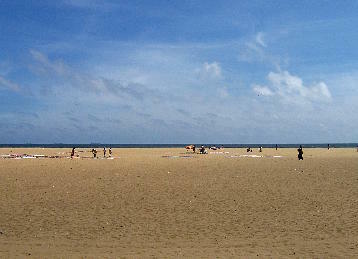 We did quite a quick tour of Chennai, using it mainly as a point of arrival and departure from and to Europe. 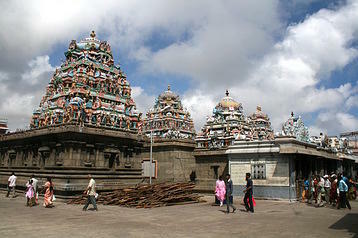 Still, it was our introduction to Tamil Nadu, which is very different from the north we had visited before. Very different. 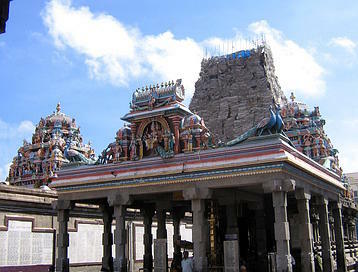 The first day, we visited our first Tamil Nadu temple and saw our first gopuram, which was covered with scaffolding, a site we were to see again and again. 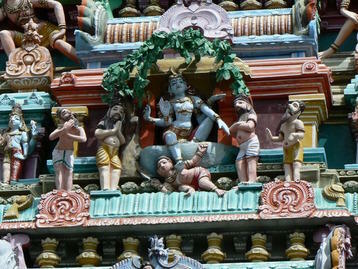 There are a number of other exuberantly decorated towers though, as are shown in the pictures. 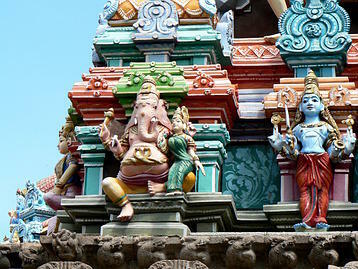 The statues (mostly in plaster) and the colors are almost fantastic. Kapalishvara Temple, dedicated to Vishnu See the scaffolding on the high tower? We then made a fairly rapid tour of the city by car. 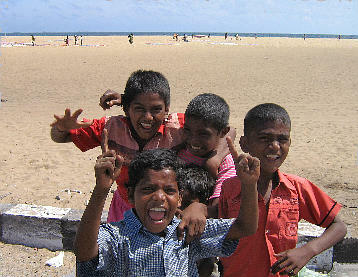 We drove by Marina Beach for our first glance at the Indian Ocean and our first glance at bold and friendly Tamil kids. We would see a lot more of both. We had lunch in a real Tamil restaurant and had our first acquaintance with what they call a "meal" there. For 30 rupees (about 0.60 € or a bit less than one US$), you get an unlimited vegetarian meal which looks delicious. You get a big metal tray, the edge an inch or so high, with palm leaves spread out over the bottom. Rice is served into the middle of the leaf. Then waiters come by with very large bowls of various vegetable dishes and plop down healthy ladels-full of each around the edge of the tray. Then the fun starts. Using the right hand, previously washed, the diner (maybe "eater" is more appropriate) mixes some of one or more veg dishes with the rice, stirs the whole pile up into a sort of goop and carries it (literally, still with the right hand) to his mouth. And so on. It sounds "gross", but in fact they are so skillful at it that it's not at all repulsive. Afterwards, there is a long line of people at the washbasin to wash their hands, particularly the right one and sometimes all the way up to the elbow. They saw us looking wonderingly at them and smiled knowingly and happily. It must have been delicious. Not knowing anything about these "meals" at the time, we just ordered rice and a couple of dishes, which was more than we could eat. Wow, can those people eat! And it's spicy too, even more in the south than in the north. The only time we ate a "meal" (in Tiruvannamalai), we asked for a fork. Boring westerners. 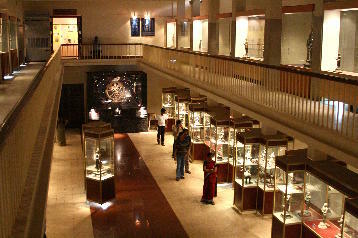 We then visited the Government Museum, which has a beautiful collection of bronzes. 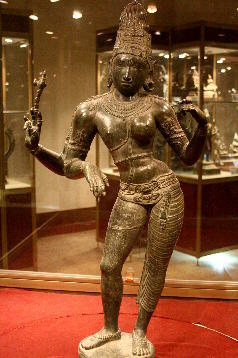 Here, we first saw a statue of what can be called an androgynous Shiva, right-half male and left-half female. 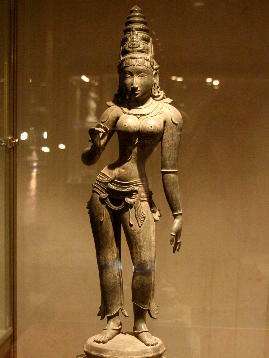 It's called Ardhanarishvara, "the Lord being half-woman". It can be considered as representing "the inseparability of the male and female principle, cause of creation. 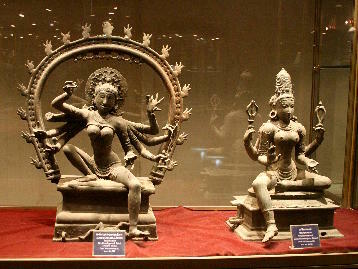 The right half of the image represents Shiva, the left Parvati. Ardhanarishvara has been interpreted, among other meanings, as the union of the passive spirit (purusha) and the active nature (prakriti), or as the embodiment of the universe. The same notion is conveyed, in a more abstract form, by the linga emerging from the yoni." 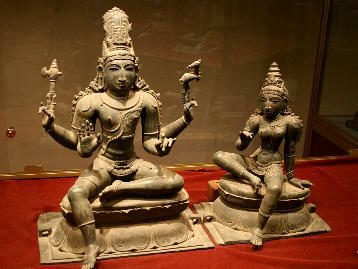 (Dallapiccola, Anna L., Dictionary of Hindu lore and legend) One also can see it as the male and female sides of Shiva, the female side being his bhakti, or energy. For more pictures of the works in the Museum, check out our gallery. The other high point of our visit to Chennai was the flower market, which we saw on our second visit, at the end of our tour. Words are irrelevant here. The beauty of the colors, the bustle of the crowd and the friendliness (you'll hear that a lot) of the people was what it was all about. For pictures, look in our Chennai Flower Market gallery. After Chennai, we drove south towards Mamallapuram, stopping first at the open-air museum at Dakshina Chitra. 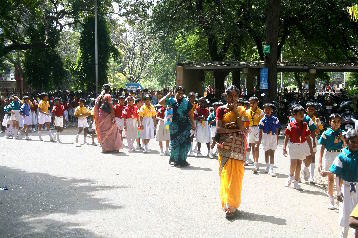 Back to home page/accueil or to India 2008 Tamil Nadu tour.